This week I have been thinking a lot about my motivation for being here in New York on a mission. Not only that, but I’ve been thinking a lot about my motivation to live a clean life, to stand out from the world, to be a disciple of the Lord Jesus Christ, etc… And I’ve realized that for me, it all comes down to love. Love for my Savior, love for the people around me, love for the Gospel. I want to emanate that love to the world! 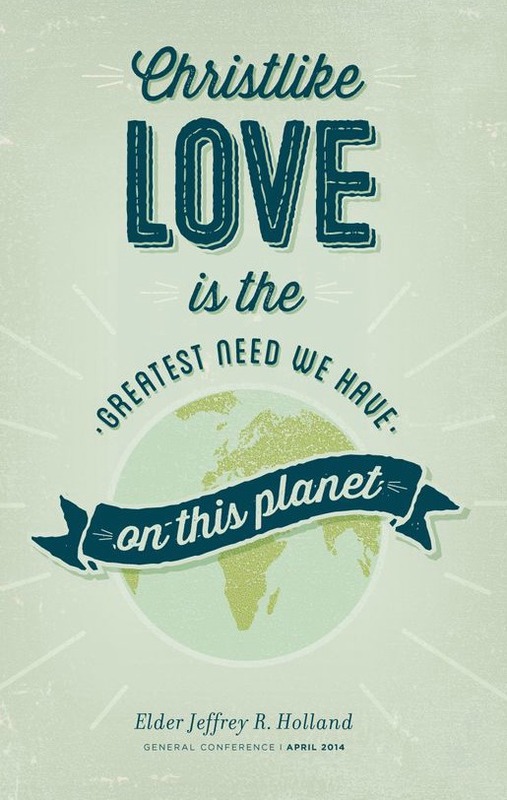 Think of it…can you imagine a world filled with people who emanated the pure love of Christ?! I recently came across this gem of a talk by Elder John H. Groberg about the power of God’s love, and I simply can’t resist sharing it: “God’s love fills the immensity of space; therefore, there is no shortage of love in the universe, only in our willingness to do what is needed to feel it. … When filled with God’s love, we can do and see and understand things that we could not otherwise do or see or understand. Filled with His love, we can endure pain, quell fear, forgive freely, avoid contention, renew strength, and bless and help others in ways surprising even to us. This is the love that the world desperately needs. And YOU can go and bring that to someone today. Where can I find that kind of pure, unfailing love? What will bring my heart enduring joy? I know from the bottom of my heart that God is there. He loves us, and that love passes all understanding. So in this time of Valentines, turn your heart towards your Great Creator, and let Him fill you with His infinite love! “My dear sisters, your Heavenly Father loves you—each of you. That love never changes. It is not influenced by your appearance, by your possessions, or by the amount of money you have in your bank account. It is not changed by your talents and abilities. It is simply there. It is there for you when you are sad or happy, discouraged or hopeful. God’s love is there for you whether or not you feel you deserve love. It is simply always there. His love is purely, perfectly, and divinely UNCONDITIONAL. If you don’t believe it, kneel down and ask Him yourself because it’s about time you do! Lately my mind has been called up to reflection as to what my life would be like without the Gospel. I have often sat and wondered what would be worth living for or how I would find lasting happiness. As I reflected upon these things, I thought about the relationships in my life–those I care about deeply and the love that we have shared. In my reflecting I came to the conclusion that without the Gospel, the only thing that would come close to bringing the same purpose and joy into my life is love–that deep and abiding love that is shared between people. Mothers, fathers, children, spouses, best friends, boyfriends; no matter where it comes from, to share a mutual feeling of pure love from someone who values you is a precious gift. Nothing else in the world, whether it be careers, money, traveling, school, music, etc., could be fulfilling enough for me to find true happiness. Today, however, I have come to at last truly understand that the two divinely connect: the Gospel IS love! God is love. The reason that love exists and can be felt in its intimacies and extremities is because God has given it to us. That is what this life is all about. That is what God’s plan is all about. Pure and abiding love is the greatest joy we could ever experience. Think of the purest love you have felt in your own life. Can you describe it? I recently heard someone say that God does not love us because He is God, He is God because He loves us. Unconditional love is the foundation of the world. It is the foundation of the Gospel. It is the pure essence of Christ! It is His matchless gift to us. Are you using it? Are you letting it fill your life? What is your foundation? I want it to be absolutely clear that I love the Savior with my whole heart. His love has healed me. It has guided me, it has uplifted me, it has strengthened me, it has kept me safe, and it has filled me with an unspeakable fullness of joy. His unconditional love is the foundation that I have built my life upon, and because of that, I know I will never fall into hopelessness, loneliness, or despair. These are the blessings that lie in store for those who come unto Him! If we truly understood that, would we let anything stop us from following Him?